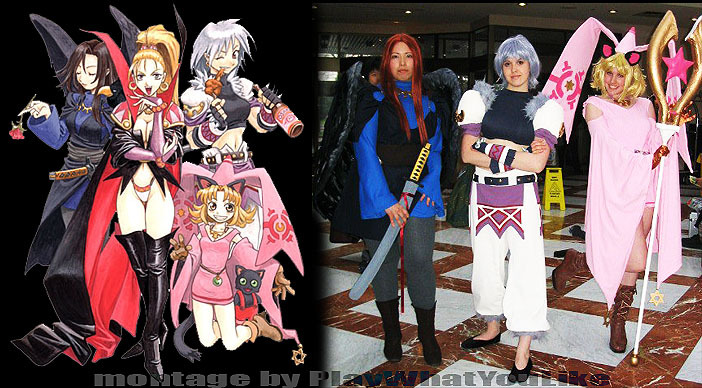 By the time we got around to playing Rhapsody, Disgaea was out and making waves in the SRPG world. 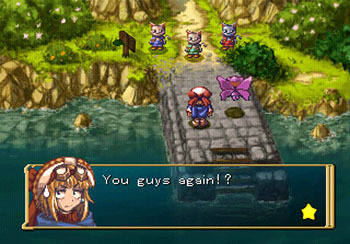 It focused attention on Nippon Ichi Software, the developer of both titles. We decided to play their SRPGs roughly in the order made. Rhapsody offered insight into future games by NIS. 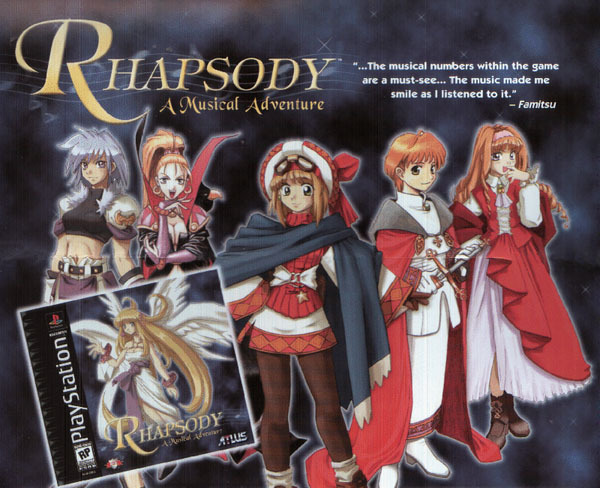 Every SRPG aficionado has reason to be knowledgeable of Rhapsody. It was the first SPRG foray into North America for NIS. But “knowledgeable” does not mean one has to log hours playing, because the target audience of this game is 11-year-old Japanese girls. While there is nothing wrong with that, we can hardly think of a less promising demographic in terms of North American sales forecasts. Before internet games and independent publishing fully bloomed to widen the spectrum of players, we have to wonder what was going through Atlus’ mind when they decided to translate and import this Japanese game. Despite its incredible femininity, we still played in hopes of an enjoyable tactical experience irregardless of juvenile content. 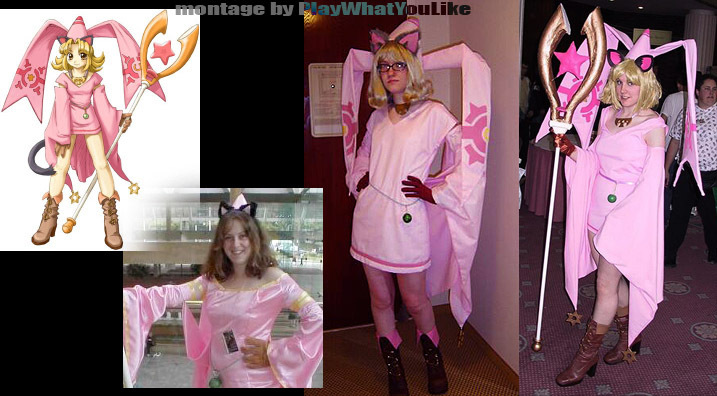 NIS has many devoted fans out there. Analyzing this game started us on a journey which eventually told us whether or not this fan base was fully justified. Check out this impressive, professional looking sculpture. 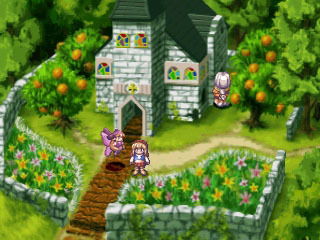 The design of Rhapsody built atop standard RPG traditions more than many other SRPGs. Overall look and environments stand up well or better than most similar titles on the PlayStation. The camera looks down upon a 2-D painted world for most interactions but sometimes lowers to eye-level. 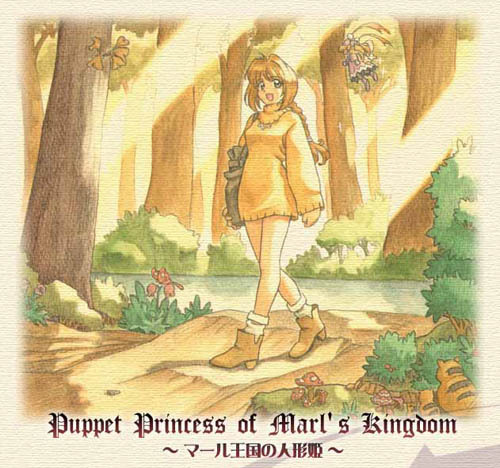 There is some cosplay out there regarding Rhapsody’s lead character, the Puppet Princess herself, Cornet. 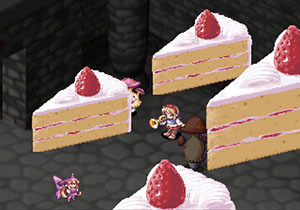 Lead Character Cornet’s cornet Sound Byte: There is a lovely 10 second sound byte in which Cornet plays her horn. It has stayed with us as pleasant and memorable. A pleasing soft sound. A minor thing really, but it makes our list. Hear it below at TIME INDEX 3:16. Soothing Background Sounds: The stylized background music, not the vocal singing numbers. The former were enjoyable if slightly puerile. The latter, we will leave to you in the “Good and Bad” section. Quality, Lots of Quality: There is a decent amount of content in this game. Some of it you may like; some of it may make you gag. However almost all of it is high quality. They developers seemed to care greatly about this product and did not let junk pass muster. Nice sprites. Microscopic, but nice. Apparently girls play SRPGs in decent numbers in Japan. In other countries they watch the Kardashians… ugh. Nippon Ichi set the bar very high in every visual category (but special effects). Artist Yoshiharu Nomura crafted a series of good-looking characters including humans, puppets, and animals. His designs, whether your taste or not were of excellent quality. His portraits take a backseat to none. The backgrounds were one of the first things that caught our attention. Having experienced many games on the PlayStation, we were pleasantly shocked by the rich, verdant painted backgrounds. Lush forests, colorful buildings and an overall texture that seemed lifted from the pages of a painted storybook. We do not know where all those colors came from, and have to wonder why other PlayStation game environments did not quite match up. The menus were and text boxes were well done and readable with subtle transparency. The colors chosen for highlighted grid squares worked well. Once again, all this under the constrictions of the PlayStation. Puppets… are your Weapons: It is an interesting enacted concept. In this game a party of puppets are amassed instead of a crew of people. It fits the property, and the puppets have some personality, but it may not be everyone’s cup of tea. Myao does not look much like a bad guy. A Quick and Efficient Combat System: Button presses and combat decisions are quick and easy. However the combat system is shallow. As deep as an 11-year old Japanese girl might like. Musical Numbers: Broadway style singing and dancing is almost never in a video game thing. Rhapsody is the reason we have to have “almost” in that sentence. Many people who played this game recall these numbers fondly. Though we did not care much for them, they were well done and in some strange way fit this game. Review the clip below if you choose, and make your own determination. 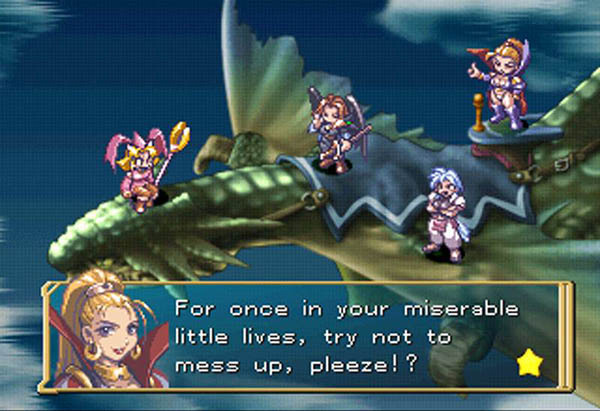 Explore Your World: Like in many standard RPGs, towns are combat free zones to be explored. Rhapsody adopted this well and it was mechanically sound. However we would have preferred interaction with shops and townspeople to have more substance and interest. Failure of Message: A great pitfall in any video game when a player gets the point of saying, “I just don’t know what to do next.” Then they proceed to wander around aimlessly, draining there desire to play, and goodwill towards the game. In our opinion it went beyond the occasional missing of a clue. 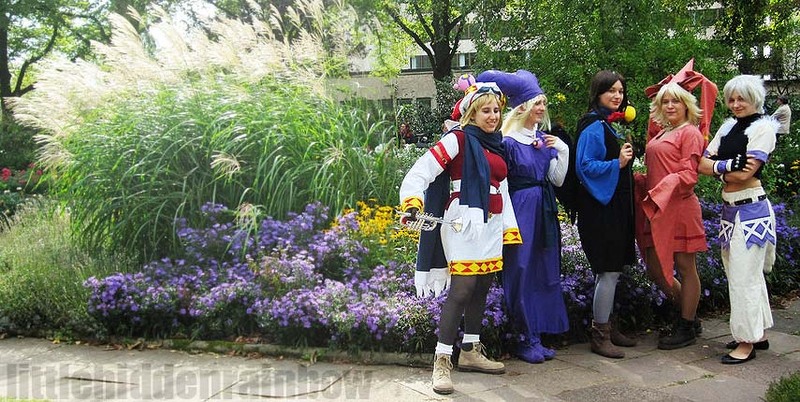 Not only is Crowdia cosplayed well here, but also… Burdy? Static Experience: We have no need to pull punches and deliver our analyses as we see them. You can play this game for two hours or twenty hours, but aside from some inane story elements and characters your experience will change very little. Get a Compass: One reason people play SRPGs as opposed to RPGs is they enjoy streamlined navigation. There is a world map and there are locations of interest. There is not a lot of wasted time or movement. Rhapsody got us lost in senseless mazes like caves. Save it for RPGs please. These caves were so much fun! *This statement not approved by the Truth Squad. That was Random: Abuse of the random encounter can destroy the enjoyment of a game. 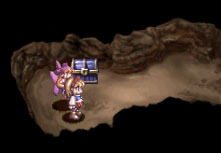 Final Fantasy Tactics limited them to stops on the world map. It was tough, but fair. It seems Rhapsody can lapse into a random (and meaningless) time-sinking encounter every time we sideways scroll to another screen. Ugh. Yup. Stuffed sidekick cosplay. Burdy. The (lack of) Tactics: This is a strategy role-playing game. Sometimes called a tactical role-playing game. Note the words “strategy” and “tactical”. We know the combat system was simplified for the target audience, but we saw little progression and got tired of mashing. An 11-year old Japanese girl might too. Pretty, but also pretty flat. There were no elevation decisions. Maybe you can explain to us what is fun about wandering around, lost in a maze, and subjected to random encounters? You have to keep exploring to find your way through, but every bit of exploration done opens up another random encounter. That was not fun. That was the opposite of fun. If judged solely on art and overall quality, Rhapsody is an excellent game and portends good things for NIS. However once you factor in design and content choices, the future becomes more muddled. We learned just about all we were going to after ten hours, and without the enjoyment factor there was no reason to play on. Okay, so we like happy endings. We would recommend Grandia (PSOne). It has more well rounded appeal and is a better game overall. It is a 99.9% certainty that 11-year-old Japanese girls, or even an 11-year-old American girls are not reading this analysis. But if they were, we might, might recommend this game to them. But to everyone else who enjoys this genre, you can do better than this shallow experience. That is of course unless you are looking for Broadway style numbers.